Get dinner in the works without missing a minute of the movie. After a day on the mountain, you'll have yard sale stories a plenty to laugh about over dinner. There's no such thing as too much fireside time. It's indoors, which makes for a lot less shivering when you finally get out. Stay bundled up from skiing and enjoy one last look at the mountain views before dark. You won't have to go far to enjoy the slopes. Evergreen is part of Keystone Ski Resort, with courtesy shuttles to the lifts. Take a vote on indoor or outdoor hot tub, then grab your towels and go. Play a round of golf at The River Course at Keystone, just a seven-minute drive away. Tranquil and low-key, Evergreen Condominiums is tucked in among thousands of Lodgepole pines near the Snake River. It’s your serene mountain escape, without being too far from the action. Courtesy shuttles keep you connected to the lifts, shops, bars and restaurants at the nearby Keystone villages, so you don’t have to worry about mapping your destination or finding a parking spot. Knock yourselves out on the slopes all day, then rally in time for a stop at the indoor heated pool before dinner. On-mountain lunches add up astoundingly fast, so stock your condo kitchen well and plan to eat-in for dinner. Summer days are ideal for the outdoor BBQ and picnic area, while the winter season will have you craving heartier fare like chili and lasagna. Convenient onsite ski storage eliminates at least one major trip hazard inside your condo (though unfortunately doesn’t keep LEGO creations and stuffed Pokémon characters out of the way). Spacious one- and two-bedroom residences are individually owned and decorated, and all have private outdoor balconies for maximizing the views. They start at 600 square feet and comfortably sleep up to six mighty mountain conquerors. (Even mini-conquerors get their own beds.) Return triumphant but tired from a day on the slopes, and recruit some table-setters while you get dinner going. Keep it easy, with tons of toppings for a baked potato bar and a big green salad. Flip on the fire and appoint a nightly movie-chooser, while you get popcorn in the works. You won’t get much push-back when you announce bedtime – they’ll be so tired, they may even beat you to it. Check out nearby Arapahoe Basin in addition to Keystone Ski Resort and compare lists of favorite runs. Up for off-resort adventuring? 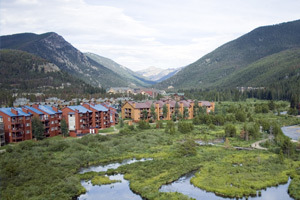 Follow the nearby Keystone Bike Path, which winds along the river to Keystone Lakeside Village, the River Golf Course and Keystone Nordic Center for fishing, biking, cross-country skiing and tubing. Or hop in the car – it’s just a short drive to Keystone Ranch Golf Course, Lake Dillon Theatre Company or the Outlets at Silverthorne.